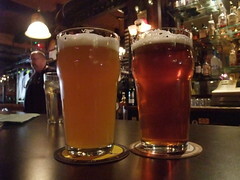 If you didn’t notice, our main goal in Portland was fresh hop beers (see my full review of what we drank here). But, this was also another great weekend of touring beer joints and hitting a few special events. Angelo and the Brewpublic crew were throwing a couple of first year anniversary events, and the Beer Retard and I were planning to hit those and more. My friend Phil also made it down to enjoy the weekend. All it took to get us down to Portland was a $60 round-trip Amtrak ticket, and a $75 Priceline.com room to split at the Westin. Not a bad deal. We had an action packed day on Friday, and Saturday wasn’t too shabby either. Deschutes Portland Pub & Brewery – We got into town around 11am on Friday and headed over to the Deschutes pub for lunch, where our first beer of the weekend, the Fresh Hop Mirror Pond Pale Ale (read my review in the previous write-up), was also our best; I won’t go on anymore about that. I’ve been to the Deschutes pub in the Pearl District several times now, and I’m always a fan of stopping by to see what special beers they have on tap. Plus, it’s near the train station. The NW Mushroom Pizza was a solid choice for lunch. always necessary (but, our friend Phil did come through later that evening with rides). We hopped on the #20 bus over towards the east side of town, and we headed to the Horse Brass for a couple of pints. I’ve heard quite a bit about Heater Allen and their lagers, but I had yet to try anything. So, I was happy to find their Schwartzbier on tap. It was a perfect early afternoon beer with a low ABV and lots of roasted malt packed in. Absolutely clean and easy drinking; exactly what I look for in a session beer. I also notched a fresh hop beer by putting down a tasty Full Sail Lupulin before we headed out. They were in the midst of preparing for a “GABF Winners” night at the bar, where they would be pouring quite a few medal winners from this year’s GABF. Tempting to stick around…but more destinations were calling our name. Bailey’s Taproom – The bus let us off right near Bailey’s, and it would just be wrong to walk past without stopping in for a schooner, right? So, we ticked another fresh hop brew off our list before heading to the hotel for a breather. This place rocks. More on Bailey’s in the Saturday portion of the write-up. Saraveza – I was hesitant about heading into enemy territory (it’s a GB Packer bar) for beers, but the Brewpublic Anniversary party was too much of a draw to let that bother me. It seemed like a very cool little bar, but by the time we got there it was unfortunately packed and we hadn’t eaten. Looked impossible to get food, let alone eat anywhere. So, we opted to just grab a beer and then head out in search of eats. Now for my worst choice of the weekend: the one beer I grabbed was a beer from Upright Brewing called the “Turkey on Rye”. The board kind of billed it as a chocolate/chili beer, but we were later told it was the Upright #6 with Turkish chilies added and then soured with Brett (no idea what was “chocolate about it”). So, it’s essentially a sour chili beer. Now, maybe a 4oz sample of this would have been ok to try and say, “Hey, I’ve never tasted anything like this. Interesting…but not at all my thing.” But, it was served in a whopping big pint glass and I was doing my best to get through the whole thing, which didn’t happen. I made it about ½ ways through the pint and gave up. For me, the sour/chili combo never needs to be repeated. But as always, you’ve got to commend a brewery for being adventurous. One of Chris’ friends even said that he loves this beer…so, to each his own. Overall, it looked like the Brewpublic crew had quite the crowd in there and were ready to party it up. It was nice to meet Angelo; kudos to him for putting on the special event. But, we seriously had to get some food in us. I’ll have to head back sometime when it’s not so packed. Por Que No? – Big thanks to my friend Phil for suggesting this taqueria for a quick dinner. Great tacos and it was right down the street from Amnesia Brewing, which meant they probably just wheeled down the keg of Desolation IPA that we enjoyed a pint from. Concordia Ale House – This bar has been on my list of places to hit in Portland since I first visited the city a few years ago, but I had sadly never made it up there on previous trips. It’s very inconspicuously located in a strip mall next to a Subway, but you head in and the place is quite large with three different rooms/areas. The tap list was pretty stellar, and I opted for the Cascade Brewing Cascadian Dark Fresh Hop. I’m a huge fan of Ron’s beers, and this was no exception. It was a very nice dry stout. But, the fresh hop aspect really just did not come through much, if at all. One thing that I loved about this place is it seemed to be an awesome place to watch sports while drinking good beers. They had several flat screens located in the bar area and in a back room with pool/darts. McMenamin’s Kennedy School – Holy crap. I can’t believe I had never been to this place before. I’ve always heard that it is a cool place to stay while in town, but I’ve never been able to get a room there when I look (usually over OBF weekend). It’s a short walk from Concordia, and Phil thankfully led us over and gave us the grand tour, with a beer in hand of course. For those who don’t know the place, it’s an old elementary school that was bought by McMenamin’s and converted into a hotel/adult playground full of bars. There is a full restaurant, and maybe four or five additional bars (maybe more?) in unique locations such as the boiler room. There is a movie theater in the old gym complete with couches, and there is a patio area in the middle of the school with a huge fireplace area to hang out by. Oh, and they of course have their own brewery on site (located in the old girls bathroom). One of the most amazing and unique beer places I’ve ever visited, and it should be a must hit on any first-time trip to Portland. Don’t expect to find a crazy beer list with Imperial IPAs and crazy stouts. They have the same standard lineup available at most McMenamin’s locations, along with a few seasonals available in the main restaurant. For the most part, they make sessionable, well-crafted beers. The name of the beer we had escapes me, but it was a solid pale ale. I will look forward to staying here with Jeanne someday. The Green Dragon – Our final bar destination of the night. This was my first trip to the once-independent bar that is now owned by Rogue. There was a big commotion over Rogue taking over the bar some time back, but it’s good to see that not much has changed. Great tap list (mostly non-Rogue beers) and a welcoming vibe. We enjoyed one last fresh hop beer for the day; the 4th Street Fresh Hop was pretty tasty. 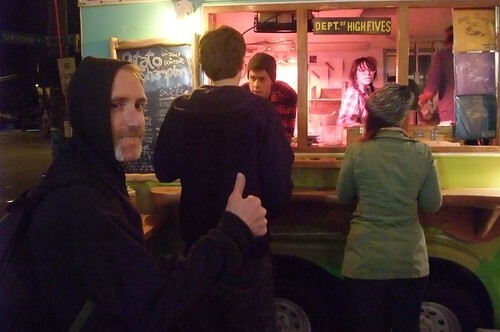 Potato Champion – It was Chris’ mission to make it to this food cart near Green Dragon by the time we left Portland. It’s not hard to talk me into late-night frites. Damn good frites served in a traditional cone with a varied selection of dipping sauces. I knock them down a notch for not having curry catsup, though. It would be an easy addition to their lineup, and every frites shop I ever visited while in Netherlands/Belgium had this tasty catsup to mix with the frites sauce (mayo). Yes, Seattle needs more food carts. So, we hit a total of 10 drinking/food establishments in one day. Not bad, huh? We did manage to space out the drinking with lots of water and spread it out over a thirteen hour period. Click on any of the above photos to see all my Portland photos from the trip.